The Swiss-based Ensemble Tzara stops by Roulette for a performance of the world premiere of a new composition from Robert Ashley along with recent works by Timothy McCormack and Ensemble Tzara’s own resident composer David Sontòn. 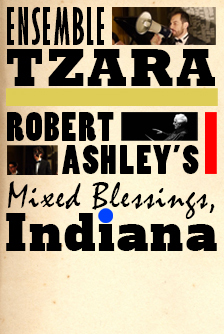 Inspired by Robert Ashley’s fascination with Rumantsch, the little-known fourth Swiss language, Mixed Blessings, Indiana takes the advertising leaflets for books of contemporary American popular literature as source material for the composition. In Ashley’s remarkable work, the titles, authors, and the numeric commercial book identifiers (catalog numbers, ISBNs, e-book numbers, postal addresses, etc.) are translated into Rumantsch and the resultant abstract texts allow for an impersonal use of the language that carries its own rhythmic structure. Born equally of chance and determinism, the score, for French Horn, Cello and Keyboard Synthesizer and voices, offers the musicians 16 ordered sequence and the musicians’ free choice of which score to perform determines the outcome, transforming the ephemeral into the real. McCormack’s Interfacing with the Surface explores a tense volley of sounds, an interaction between instruments and static electronic noise. Sontòn’s La metta da feine round out the evening’s performance.